Here we are, it's been over a month now since the unbanning of Jace, the Mind Sculptor and Bloodbraid Elf that we finally have a metagame forming in Modern. So today I've put each deck though a series of scientific tests to determine what are the actual ten best decks in Modern right now. I used classified logarithms and algorithms with the most powerful super computers as well as old school scientific studies with beakers, flasks, and test tubes. All of the results from the hours of testing have led to these ten decks being the undeniable best in the format, so if you're looking for the deck to play or for bragging rights with your friends then you've come to the right place. Without any further ado let's get right down to it the Top Ten Decks in Modern, starting with a deck that almost made the list but didn't quite, so I wanted to give a special shout out to it. Even though your deck didn't make my top ten list, it was very close and it probably will next time. Your deck has some cards to play in the early game, has a killer mid to late game, and has a perfectly tuned sideboard. Unfortunately this list can only fit ten decks on it, and although your deck is certainly worthy of a spot, a line has to be drawn somewhere. Keep working hard though because your deck is a wonderful choice for #SCGMKE! The biggest impact that Jace, the Mind Sculptor has had on Modern so far has been as another win condition for the Blue Moon decks. There are a variety of different versions of this deck, with some people relying on the combo finishes of Through the Breach and Emrakul, the Aeons Torn or Kiki-Jiki, Mirror Breaker and Deceiver Exarch, while others like Ross Merriam here forgo that plan and use Jace to drag the game out. I personally prefer this heavy-control version as it doesn't have the dead cards in it that either piece of a combo are without the other. Instead I'd rather rely on a bevy of interaction spells and then the power of Blood Moon and Jace, the Mind Sculptor to clean up games. This deck jumped onto the scene at Grand Prix Phoenix a couple weeks ago and had success at #SCGCIN last weekend, and I only expect that to continue moving forward. Coming in at number nine on the list is Jeskai Control, a deck that would have been much higher on my scientific rankings scale before the unbannings, so it's quite the surprise that it's down this far even after recently getting access to the most powerful planeswalker ever printed. However, Jeskai Control had a huge target on its back in the early stages of the new format and hasn't really recovered yet. Moving forward though, Jeskai Control has some good matchups against the top decks on the list later, which is why I still have it in my top ten for now as I expect it to make a comeback. The versatility of this deck is incredibly vast with an unbelievable amount of playable cards in the colors, meaning that the deck can be tuned to beat anything it wants. Therefore, the biggest challenge is picking out the exact 75 for the weekend, and when the right combination is built it will be winning tournaments again shortly. I've always been a big fan of the Tron lands, which are maybe the most polarizing cards in Modern. Even though some people think they are too over-powered, I believe they single-handily make the big mana archetype viable, allowing another style of deck to exist in Modern, a format filled with powerful one mana spells. The most surprising thing to many is that since Bloodbraid Elf brought back Jund into prominence, the overall viability of the Green Tron decks has gone down. That matchup is still favorable for Tron of course, but not nearly by as much as before because Bloodbraid Elf has sped up the clock of Jund while allowing it to hit sideboard Fulminator Mages more often. Combine this with the speed of the format increasing along with Jund and many some poor matchups up at the top of the list, and Green Tron decks are currently trending in the wrong direction. However, if Jeskai Control resurges then Green Tron may follow swiftly. This is a deck that I think was severely underrated for months because I have played exactly one league a month with this deck for a long time now, thanks to my stream supporter Xanthos, and I seem to always go 4-1 with it. I think I need to consider playing the deck at a tournament. Well after winning Grand Prix Toronto and then the Magic Onine Championship the Bogle is out of the bag now and G/W Hexproof is a deck on everyone's radar. That's not stopping the success of the deck, as it not only has a fast goldfish that allows it to beat its bad matchups, it also has plenty of very good matchups on this list. When building sideboards moving forward you definitely need to keep G/W Hexproof in mind, which means more copies of cards like Engineered Explosives, Blessed Alliance, or Settle the Wreckage should be seeing play. I'm sure this is farther down this list than many people expected to find Jund, but science doesn't lie. Jund is still the premier midrange deck of the format, even though there is another midrange deck ranked higher, and it doesn't have any truly poor matchups across the board. However, I don't think it has any truly great matchups either, and that its "favorable" matchups such as Humans, Infect, Storm, Affinity, and Hexproof are all currently overstated and not as good for the Jund player after the addition of Bloodbraid Elf as one may think. Jund also has a large target on its head right now with everyone having a dedicated plan for the deck which is something that not many midrange decks can say. Taking this into consideration as well as having the favorable matchups being quite close makes me hesitant to rank Jund any higher, but at the end of the day the deck is filled with incredibly powerful and efficient spells across the board, and it's always a good choice. 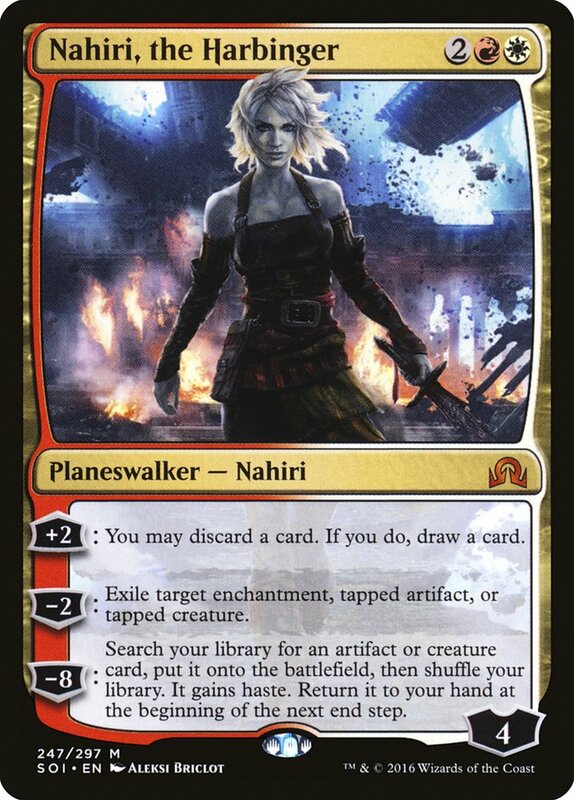 Every time I see someone not do well with Mardu Pyromancer I don't see a Nahiri, the Harbinger in their decklist, and I think there is a strong correlation. Every ability with Nahiri is perfectly built for this deck, from looting to exiling large creatures or problematic enchantments to searching up Bedlam Reveler to refill the hand. The fact that there is a wonderful target for the ultimate ability without having to put a dead draw like Emrakul, the Aeons Torn in your deck is really nice. This is definitely a deck I'll have my eye on in the future. One of the biggest misconceptions in all of Modern right now is the amount of variance in the B/R Hollow One deck. Everyone knows about the incredibly explosives draws when the cards line up for you, but the floor of the deck is much higher than most people realize. I've heard time and time again that there are draws from B/R Hollow One that don't do anything, but I've also had a lot of experience with and against the deck by nowm and I don't think it has a similar floor to the other top tier decks. At worst it's still putting a big creature or two onto the battlefield in the first couple of turns and will likely have a recursive creature to bring back. I know that isn't necessarily beating many opponents, but the floor of decks like Affinity or Green Tron are much lower in my opinion. What you're really playing for with B/R Hollow One is the incredibly high ceiling, as well as the consistency that cards like Faithless Looting and Street Wraith provide towards hitting the ceiling. Even though a turn 2 kill is possible, usually attacking for lethal on turn 3 or 4 is good enough. B/R Hollow One has basically replaced Grixis Death's Shadow currently as the heavy graveyard deck of the format, and I don't expect that to change anytime soon as this deck is both more explosive and more resilient against removal spells. Affinity was a deck that I personally wanted to put lower on the list, but unfortunately all of the scientific testing proved that it still deserves to be up here. It's much better positioned in the metagame than many realize due to the regression of Mardu Pyromancer and Jeskai Control, and has secretly been putting up solid results recently. Dylan Donegan played the deck for the first time this past weekend and took it all the way to a second place finish in the Modern Classic, beating Jund deck after Jund deck, which looks to be a favorable matchup for Affinity as written about by Dylan earlier in the week . Affinity also ended up taking down Grand Prix Kyoto last weekend as well, as people have been shaving on their artifact hate recently thinking Jund would hold the deck back. That's not the case, however, and for the upcoming Modern Open, #SCGMKE, I fully expect Affinity to try and make a large push into the metagame and that you should be ready for it. There's absolutely no denying the power of U/R Gifts Storm right now as it followed up a second and third place finish at #SCGDFW by taking home the first and third slots at #SCGCIN! This is the scariest deck in Modern and it not only has the most consistent turn 3 win of the format, but is also much more resilient than anyone not named Caleb Scherer or Paul Muller realize. With the finishes this deck is putting up on the SCG Tour® recently I really wanted to put it at number one, but unfortunately, it's matchup against the first deck is poor enough that it's sitting in second place. That's about the only poor matchup for U/R Gifts Storm these days, as a pile of removal and discard spells isn't enough to get the job done. You need to be able to completely dismantle their resources, probably multiple times, to hold back this deck for good. Like any combo deck, the faster the clock you can put on them the better, and the combination of disruption and clock is what the top deck is built around. Humans was the most played deck at Pro Tour Rivals of Ixalan and was very successful as well, making a convincing case to be the top deck in Modern at the time. Then Jace, the Mind Sculptor and Bloodbraid Elf were unbanned, and the thought was it would increase the amount of interaction spells up to an unbearable amount for the poor Human tribe. Fast-Forward a handful of weeks and Humans is still very successful, with winning Grand Prix Phoenix as well as putting up result after result elsewhere. The strength of the Humans deck, in my opinion, is built on its ability to consistently disrupt the opponent as well as win games quickly. It punishes just about every below average draw from any opponent, even with its below average draws. 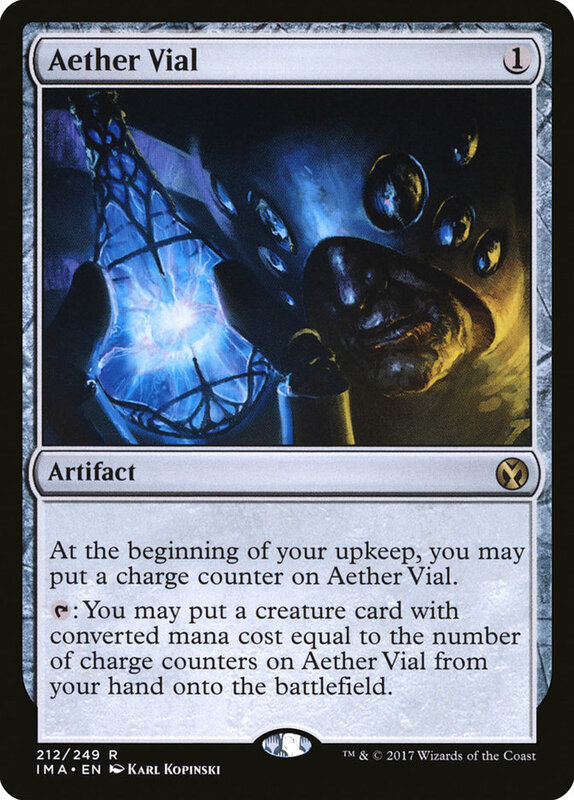 When it's running on all cylinders Aether Vial allows it to have an incredible mana advantage that enables multiple high-impact creatures entering the battlefield at the same time. Although simply saying the more removal a deck has the better it's Humans matchup is may be a mostly true statement; this mana advantage that Aether Vial provides means that you need to be able to keep up with the removal spells, which can be difficult. Also you need multiple different removal spells so that you don't get locked out from Meddling Mage. These things help allow Humans to be able to win matchups against removal heavy decks while having incredible matchups vs many combo decks, making it worthy of the top slot on my Top Ten Decks in Modern list. So there you have it folks, the ten absolute best decks in Modern. If you're looking for a new deck to play, or have a few choices and want to know which one would be the best, then hopefully this list was helpful. For those of you that already know what you're playing and it's not on this list, then you have your work cut out for you to figure out what you need to do to beat each one of these decks, because at the end of the day they are better than your deck. Which only got an honorable mention. Destroying Lands And The Competition: The Essential Guide To G/R Land Destruction!